The traditional post-college career path to a hedge fund are investment banking and sell-side research. Both are great at giving you a solid foundation in company research and financial valuation, which involves analyzing company and industry trends, modeling and forecasting, valuation, and presenting your ideas in a clear, succinct way. Besides investment banking and sell-side research, the next most common career path to hedge funds is management consulting. Consultants would get the same fundamental skillset for hedge funds, but with more emphasis on company and industry analysis over financial valuation. If you come from the consulting background, just be extra prepared to sell your financial modeling skills going into a hedge fund interview. If you come from a technical background such as engineering or medicine, your technical knowledge is particularly helpful to position you as an industry specialist. For example, if you understand the nuances of a pharmaceutical company’s research pipeline and the FDA approval process, you have a leg up against others as a health care investor. So if you come from a technical field, don’t give up hope. Your technical background actually sets you up well as an industry specialist at a hedge fund. A typical hedge fund can be split into investment personnel and business personnel. Investment personnel includes portfolio managers and research analysts who manage the fund. The business side consists of client management, compliance, and fund operations. Now let’s go over the career path of the investment team role to see where you best fit. Research Associates historically have been entry-level roles straight out of college. 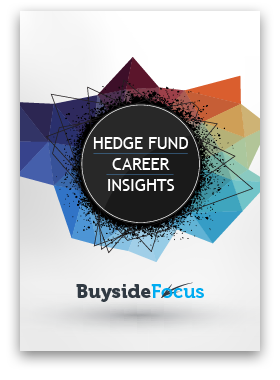 However, the hedge fund career path has gotten intensely competitive over the past 5 years, and Research Associates now typically come with 1 – 2 years of experience. Research Associates work with Analysts or Senior Analysts to help with investment research. Research Associates bear the brunt of grunt work, including developing reports and presentations on companies, markets, and asset classes. A lot of research work involves answering specific due diligence questions that Senior Analysts have. At some funds, Research Associates are also involved with trading, operations, and marketing. These include booking trades, consolidating performance reports, and helping to put together client presentations. Whether the Research Associate would build financial models depends on his or her level of experience. If the Research Associate has no prior modeling experience, then the Analyst or Senior Analyst would take leadership of building the model. It’ll be up to the Research Associate to update it periodically. Updating the model involves collecting data from data services, company conference calls and surveys. Additionally, the Research Associate help the Senior Analyst write recommendation reports sent out to Portfolio Managers. Specifically, the Associate would update charts and modifies numerical sections of the report. Although the work is support in nature and the hours are long, Research Associates are getting a great learning experience from seasoned analysts. Working for a good Senior Analyst would pay immense dividends in valuation and industry analysis. Besides dedication and intelligence, being a good Research Associate requires a high level of quantitative knowledge. This includes working knowledge of accounting, financial markets, financial analysis and statistics. Qualitatively, Research Associates need to be detail-oriented and passionate about the markets. Research Analysts typically have 3 – 5 years of sell-side or investment banking experience. Hedge funds that value the MBA often recruit for Research Analysts out of top business schools as well. Essentially, Research Analysts and Research Associates have similar responsibilities with one exception. Research Analysts are more focused on research and modeling and have a broader coverage universe. Research Associates on the other hand typically are involved with trading and operations to some degree. Research Associates are truly the jack-of-all-trades, while Research Analysts are dedicated to investment research. One of the greatest challenges for a new Research Analyst is the steepness of the learning curve. Senior Analysts and Portfolio Managers do not have the patience or the luxury to allow analysts to be uninformed or consistently incorrect. New analysts work extremely hard building trust with their mentors. When Research Analysts come onboard, it’s important to quick ramp up their investment coverage. It involves a few weeks of intense reading and attending industry conferences. A large percentage of your time would be spent on monitoring industry and company trends to predict financial results for the company. Research Analysts are constantly speaking with management, customers, and suppliers to gauge the current status of the company they are analyzing. As a Research Analyst, you must be able to respond to specific inquiries from Portfolio Managers or Senior Analysts that challenge their ideas, something that requires strong tact and a great deal of patience. Furthermore, Analysts need to be energetic, diligent and intellectually curious. For larger hedge funds and for traditional asset management firms, there is typically a layer of hierarchy between Research Analysts and Portfolio Managers. Their titles are typically Senior Analyst, Sector Head, or Director of Research. Most Senior Analysts develop either industry or geographical expertise over time and specialize in a particular asset class. Take a Senior Analyst covering the consumer sector for example. He or she would have covered about 30 to 50 consumers stocks as a Research Analyst over the past 3 – 5 years, and have been intimately familiar with the historical performance and key drivers of sub-sectors like semiconductors and internet software. The Senior Analyst is also an expert in financial forecasting and valuation. However, the burden of modeling typically falls under his or her mentorship, and it’s up to the Senior Analyst to choose which stocks to research and how much to invest in a particular stock. Senior Analysts also spend a considerable amount of time attending industry conferences, meeting with company management, and analyzing industry supply and demand trends. Another important differentiation between a Senior Analyst and a Research Analyst lies in communication with the Portfolio Manager. An important part of a Sector Head’s job is to convey his or her recommendations with conviction. A Senior Analyst spends considerable time presenting to PMs both verbally and through email. The Senior Analyst must be articulate and persuasive in his or her convictions to earn respect within the firm. Given a successful track record of making good recommendations, many Senior Analysts can become Portfolio Managers in 3 – 10 years, similar to the career timeframe of Associate Portfolio Managers. Larger hedge funds with more personnel tend to have Associate Portfolio Managers who are typically promoted from an Analyst role with 3 – 5 years of experience. Larger firms may also recruit MBAs to fit this role straight out of business school. The job is very similar to that of the Senior Portfolio Manager with one main exception: Associate PMs tend to have less client interaction. Associate PMs essentially serve as lieutenants to Portfolio Managers on portfolio construction and investment decision-making. The goal of the Associate PM is to learn the ropes from his or her mentor and get the opportunity to manage a sleeve of a large portfolio or run a new fund down the road. Although there is no set timeframe, successful Associate PMs could be promoted to full-fledged portfolio managers within 3 to 5 years depending on his or her track record and the firm’s ability to raise new funds. Hedge fund portfolio managers are general partners who have large equity interests of the fund. They establish the investment strategy and have “trigger” responsibility to decide when to execute trades. Portfolio managers receive investment ideas from internal analysts, and for small funds directly from sell-side analysts. It is up to the Portfolio Manager to extract relevant information and use their judgment to buy and sell securities. Throughout each day, Portfolio Managers read reports, talk to analysts and company management, monitor industry and economic trends to make adjustments to their portfolios. Portfolio managers are typically senior professionals with 15 – 20 years of investment experience. They have reached the pinnacle of their career path. They would likely have been a Portfolio Manager or Senior Analyst at a larger firm previously, and have had extensive client interactions to be able to build their own book. So let’s say that you’ve successfully followed your hedge fund career path plan and is now a hedge fund analyst. How long does it take for you to become a Portfolio Manager? The larger the hedge fund, the more established the timeframe. Analysts usually step up to become Senior Analyst after 3 to 5 years, and then rise to Portfolio Manager after another 3 – 10 years if the opportunity presents itself. You might also need to take into account getting a CFA, which is more common among larger funds. But if you are at a mid to small sized fund, the timeframe of your career path to PM can vary dramatically. On the extreme end of the scale, if you are the first analyst joining a start-up hedge fund, you could become a Portfolio Manager or a Director of Research within 5 years if the hedge fund establishes a superb track record and raises another fund. At that level, you would bring in million dollar bonuses after only a few years out of school. But of course, the higher reward comes with higher risk of joining a small fund. To what extent is this applicable to all types of hedge funds? Event driven? Quantitative? Long/short credit? Hi Arjun, this path typically applies to event-driven, long/short, and credit funds that are fundamental driven. Quant funds tend to have different structures.